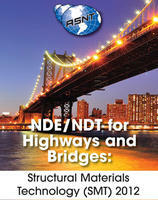 UTRC and NYSDOT, among others, are co-sponsoring "SMT 2012 Conference: NDT/NDE for Highways and Bridges: Structural Materials Technology" and invite abstracts for presentation at the conference. This conference will be held in the New York LaGuardia Airport Marriott near New York City, NY on August 21-24, 2012. The goal of this conference is to promote the exchange of information between national and international researchers, practitioners and infrastructure owners on the application of Nondestructive Evaluation (NDE) and Nondestructive Testing (NDT) technologies for the condition assessment of highway infrastructure. Contributions focused on field applications, case studies, technology implementation, applied research, and practical experience are invited. Through technical presentations and exhibits, infrastructure owners, transportation officials, researchers, consultants, and contractors will be exposed to the state-of-the-practice in nondestructive evaluation (NDE) methods. In addition, participants will have the opportunities to discuss urgent problems faced by civil infrastructure owners and the potential solutions utilizing available emerging NDE technologies. More information on the conference, abstract submission instructions, and exhibitor information, please visit the conference website. If you need further information, please contact Dr. Sreenivas Alampalli at salampalli@dot.state.ny.us.